Sir Arthur Evans began excavating Knossos in 1900. He discovered nothing less than the foundation of Western civilization. Wandering the ruins, controversially restored by Evans and his team, you’ll see immediately how the palace’s warren of rooms led to the myth of the minotaur: cursed by Poseidon, the wife of King Minos birthed a half-man, half-bull who was locked away in a labyrinth and required regular human sacrifices. Were youths killed on behalf of the beast? Did lithe dancers chase and leap over bulls through the halls? Extant frescoes seem to suggest probably and definitely, but we’ll never know for sure. At any rate, the largest and most elaborate Minoan palace on Crete is considered to be Europe’s oldest city, and offers an excellent introduction to an island so central to Greek myths. The magnificent holdings at the Heraklion Archaeological Museum span thousands of years of human history, from Crete’s very earliest settlements, dating to the Neolithic period, through Roman times. Among the most notable objects on display are a large model of Knossos (perfect if you found the ruins confusing); an intricately wrought gold pendant featuring two bees; the so-called Snake Goddess, a faience figure of a bare-breasted woman gripping snakes in either hand, thought to be a precursor to Athena; and the Phaistos Disc (pictured), a clay circle covered on both sides with yet-to-be-deciphered symbols. An entire room is devoted to sarcophagi, some with skeletons still in situ. One of Europe’s longest canyons boasts 1,000-foot cliffs. Hikers wind down from a wooden staircase at the southern end of the Omalos Plateau through rugged, dramatic terrain all the way to the Libyan Sea. Then you can have a swim or continue walking along the coast. You can head into tiny Ayia Roumeli to spend the night or catch a boat to another town. If you make the beautiful, challenging trek, expect company; not only is the 10-mile path popular with two-legged creatures from May to October, when Samariá Gorge is generally open to visitors, but it’s also home to four-legged ones, including kri-kri, a very shy species of indigenous goat. Going to Crete and skipping the beach would be like visiting New York and avoiding pizza, or heading to Paris and passing on the Eiffel Tower. The question, then, is which beach? As an island, Crete abounds with soft sands and gently lapping waves, but no beach entrances like Elafonisi. In this protected nature reserve, you’ll find white sand tinted reddish pink by coral, as well as a part of the Mediterranean Sea so shallow during low tide that you can wade out to an uninhabited island home to 100+ types of plants and flowers. Bonus: if windsurfing is your jam, then this beach is your toast thanks to great conditions year-round. The world’s oldest wine press consists of a couple of massive stone urns and a trough through which the liquid flowed 3,500-odd years ago. Underwhelming as that might sound, the dusty equipment, along with rows of grape orchards, will put your next glass of red into context. Peza, an area around the cosmopolitan village of Archanes, produces some 70 percent of Cretan wine. Many wineries welcome visitors (by appointment), or you can hang out in the town square, petting the stray dogs, staring at Mount Juktas—reputed to be Zeus’ final resting place—and sipping away the day. Speaking of Zeus, according to legend he was born on Crete then hidden in a cave by his mother after his father ate their other offspring (don’t ask). Today, visitors descend several slick cement staircases, built among loads of dripping stalactites, to a man-made lake. Despite these alterations, the cave retains much of its magic, especially when you stand at its bottom and stare back at the entrance’s rectangle of light. A word of warning: the cave houses several colonies of bats and birds, so don’t look up with your mouth open. Psychro is located in the Lasithi Plateau, rural Crete at its most beautiful. Archaeologists have discovered peak sanctuaries, or religious sites, atop several of the island’s many mountains, including those of the Psiloritis Range. Snow-capped into June, the mountains offer excellent skiing, as well as opportunities for caving, wildflower picking, bird watching, peering into sinkholes, and hiking along the E4 European Long Distance Path. On a clear day, you can see the Aegean and Libyan Seas. On a not-so-clear day, you can take refuge in one of the many mitata, stone shelters that have been around for centuries. In the running for Crete’s most beautiful city, Rethymno boasts a well-preserved old town and atmospheric harbor, dominated by the Fortezza. The Venetians built this imposing fortress in the late 1500s to protect the city from pirates. It’s open to the public and features the picturesque remains of arsenals, earthworks, and barracks. There’s also a mosque, converted from a chapel by the Ottomans who took over in the 1600s. For even more history, head to the nearby Arkadi Monastery, the site of a rebellion in which Cretans blew themselves up rather than continuing to submit to foreign rule. You’ll likely hear a taverna before you see one: the chatter of old men, the click-clack of rosary beads, the slap of backgammon tiles, the songs of those who’ve had one too many shots of raki (an alcohol distilled from the stems, skins, and other detritus left after making wine). Most meals begin with mezes (small plates), such as dakos, in which a brown, barley-based rusk gets slathered with olive oil, crumbled feta or mizithra, and chopped tomatoes. Daily specials include pites (pies) stuffed with cheese, herbs, greens, and/or lamb. But we loved the seafood best: shrimp in olive oil and garlic, shrimp with tomato and cheese, and octopus pickled or seared. It’s the largest island in Greece. It’s the center of the earliest recorded civilization in Europe. The Venetians, the Ottomans, and others, all of whom left their architectural marks from mosques to castles to fortresses, have occupied it. Paul preached his gospel here, while El Greco painted a church or two before heading off to find fame and fortune in Spain. It’s home to the longest gorge in Europe, full of indigenous wildflowers and shy feral goats. 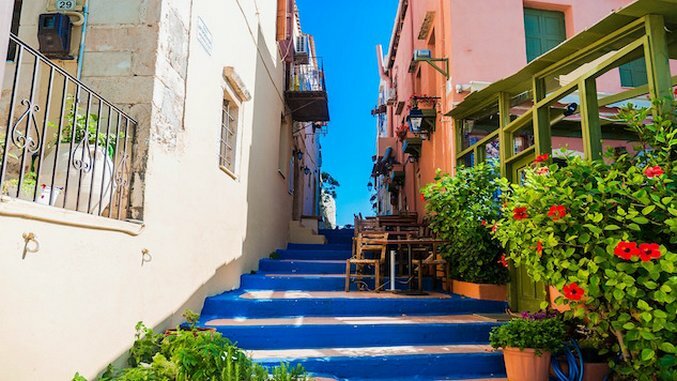 For obvious reasons, Crete is a gorgeous place to spend the weekend, or the week, or the month, to relax and drink wine, or roam from ruin to adventure and back. However long your trip, make sure you fit in these highlights. Jessica Allen writes about food, culture, travel, and New York City, where she lives.